Pat Buchanan is one of the country's most famous conservatives. Buchanan writes books and articles and appears on television to express his extreme conservative views on the issues that he believes are important to the future of the United States. He has also campaigned unsuccessfully for the presidency several times. Patrick Buchanan was born in Washington, D.C., on November 2, 1938. His father, William Baldwin Buchanan, was a partner in a Washington, D.C., accounting firm. His mother, Catherine Elizabeth (Crum) Buchanan, was a nurse and a homemaker. Buchanan had six brothers and two sisters. His father taught the children good manners but also encouraged debates and fights. Buchanan would later say that his conservative views and beliefs were shaped by growing up in this large Irish-Catholic family. Buchanan attended a Catholic elementary and high school, following in the steps of his father and brothers. Deciding to stay in Washington and to continue at a Catholic school, he enrolled in Georgetown University in 1956, studying for a degree in English. In his senior year he received a traffic ticket. Believing that his ticket was wrongfully given, he verbally and physically assaulted the police. He was then arrested and fined, and the incident left him with a minor police record. The university also suspended him for a year. While he disliked studying the technical side of newspaper publishing, he found that he enjoyed writing. He went on to earn his master's degree in 1962. Buchanan began his career as a reporter with the St. Louis Globe-Democrat. He quickly became an editorial writer for this conservative midwestern newspaper. He was appointed the paper's assistant editorial page editor in 1964. Thinking it would be many years before he could become an editor, and wanting some challenges in his life, he thought about a new career direction. He was eager to become more directly involved with politics. In 1966 he arranged a meeting with Richard Nixon (1913–1994), whom he impressed with his conservative outlook and tough political style. Nixon hired him as an assistant. At that time Nixon, who had served two terms as vice president, was a partner in a New York City law firm. Nixon was involved in Republican Party activities and was preparing to run in the 1968 presidential election. Buchanan assisted Nixon with his speeches, newspaper articles, study tours, and other campaign activities. Following Nixon's 1968 election, Buchanan joined the new presidential administration as a special assistant. He wrote speeches for Nixon and for Vice President Spiro Agnew (1918–1996). He helped make plans for the 1972 reelection campaign. During this time he met Shelly Ann Scarney, who was a receptionist at the White House. They married in 1971. In 1973 Buchanan devoted his attention to the Watergate crisis, which involved criminal activity in the 1972 Nixon campaign. He testified before the Senate Watergate Committee later that year and denied having suggested or used any illegal tactics. After Nixon's resignation from office in August 1974, Buchanan stayed on for several months as an adviser to President Gerald Ford (1913–). Buchanan then left the White House and became a newspaper writer and public speaker. He later worked in radio and television, broadcasting his conservative views on political and social issues. With his style and viewpoints, he became known across the country as a spokesman for conservatives, who support traditional values and tend politically to resist change. Buchanan returned to the White House in 1985 as director of communications at the start of President Ronald Reagan's (1911–) second term. He stayed only two years and then went back to broadcasting, writing, and giving lectures, where he made more money. In 1992 Buchanan announced he was running in the Republican Party presidential primary. His campaign against President George Bush (1924–), who was seeking reelection, was designed to position himself as an "outsider" and to promote a strong conservative program. He ran with an "American First" theme, arguing that the country should limit its obligations in other countries and take care of business at home. Buchanan attracted attention from a public facing layoffs of workers, falling real estate values, increased taxes, and general unhappiness with government. He spoke for aid to religious schools, prayer in public schools, and limits on illegal immigrants. Buchanan called himself a "street corner" conservative, saying that he learned his beliefs at the dinner table, in schools, and on the street corners of his youth. In the early 1992 New Hampshire primary Buchanan won 37 percent of the votes. However, in each succeeding primary he received fewer and fewer votes. He found it difficult to maintain a campaign organization and to raise funds, but he ran for the White House a second time in 1995, again basing his campaign on conservatism. His campaign slogan was "Reclaiming the American Dream." However, he lost once again. Buchanan also founded and directed The American Cause, an educational foundation that emphasizes his political beliefs. On March 2, 1999, Buchanan announced his bid to become the Republican candidate for president in the 2000 election. Buchanan took a disappointing fifth place finish at the Iowa primary in August 1999. On October 25, 1999, Buchanan announced his departure from the Republican Party to join the Reform Party. He declared his intention to become the Reform Party's candidate for the presidency. Some Republicans expressed relief over Buchanan's party switch following the release of his book A Republic, Not an Empire, which was published in September 1999. In this book he expressed opinions that many disagreed with regarding America's involvement in issues outside the United States. 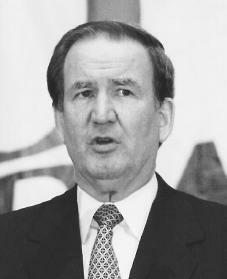 Buchanan's run for president in the 2000 election caused a split in the Reform Party. Those opposed to Buchanan tried to prevent his name from being listed on the ballot. This, in addition to health problems and declining interest in the issues he wanted to discuss, led him to finish fourth in the election. He received less than 1 percent of all the votes cast. Buchanan continues to remain in the public eye by writing books and newspaper articles, and giving lectures on conservative topics. In 2002 he published The Death of the West: How Dying Populations and Immigrant Invasions Imperil Our Country and Civilization. In this book Buchanan discusses his strong stand against immigration and his belief that immigrants are a threat to the American way of life. Buchanan, Patrick. Conservative Votes, Liberal Victories: Why the Right Has Failed. New York: Quadrangle/New York Times Book Co., 1975. Buchanan, Patrick. Right from the Beginning. Boston: Little, Brown, 1988. Grant, George. Buchanan: Caught in the Crossfire. Nashville, TN: Thomas Nelson, 1996. Hi! I am doing a report for an American Problems class. I was wondering if you could answer a few questions about Pat for me.... what are his political beliefs, what is his past voting history? Thank you! Browning, Robert Buck, Pearl S.